Are you keen to watch the Baz Luhrmann’s adaptation of the Great Gatsby as much as a guest waited in anticipation for one of Jay Gatsby’s lavish parties? Personally I can’t wait to see the gorgeous costumes and make-up. A Miuccia Prada collaboration – they raided the Prada and Miu Miu archives for over 40 exquisite costume designs. Have a quick peek here at the Great Gatsby Prada costume preview with production | costume designer Catherine Martin – divine! 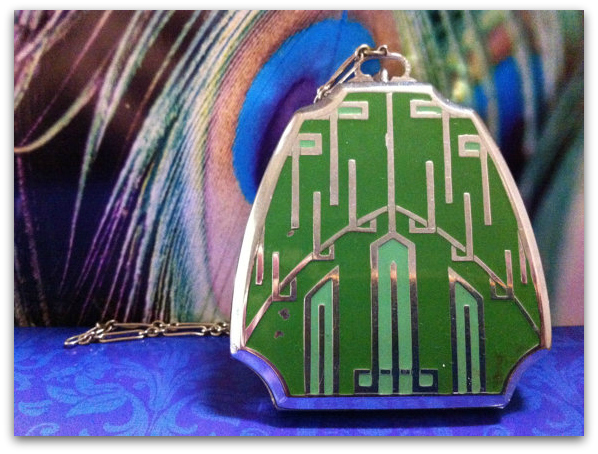 The movie has heavily influenced current fashion trends so I thought I would see what I could buy from the actual Art Deco Period. 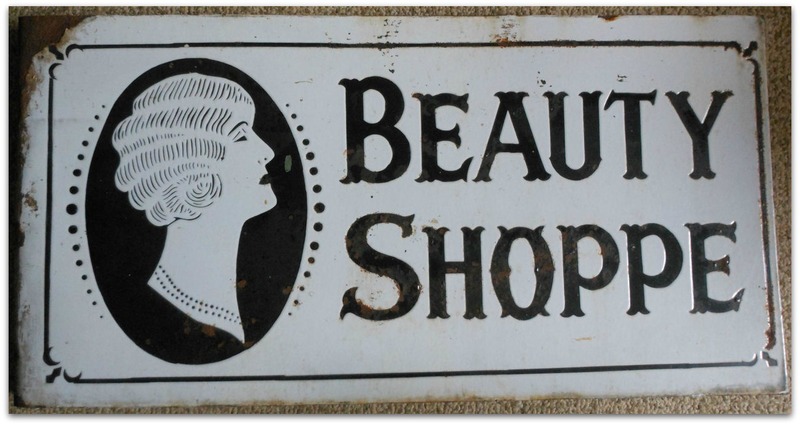 And what better place to look than Etsy which is filled with a fantastic range of shops and individuals selling an array of vintage and antique wares and is one of my favourite on-line shopping experiences. I spent several hours looking at all the Art Deco pieces, jewellery and ‘of the period’ items – marked them as favourites and then came back to them only to find some had already been sold. So if you see anything featured here that you like – nab it quick it won’t be around for long! I must say however, it was also very hard for me to just look and not buy, although, who am I kidding, I did succumb and buy some bridge tally cards. Planning to learn to play one day of course! 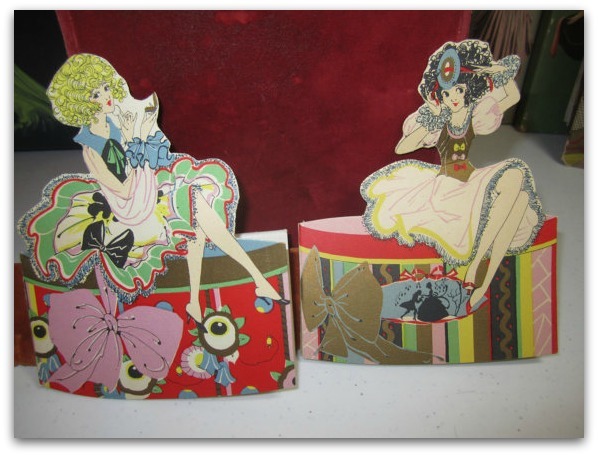 I had to have them for the graphics and illustrations which I love. 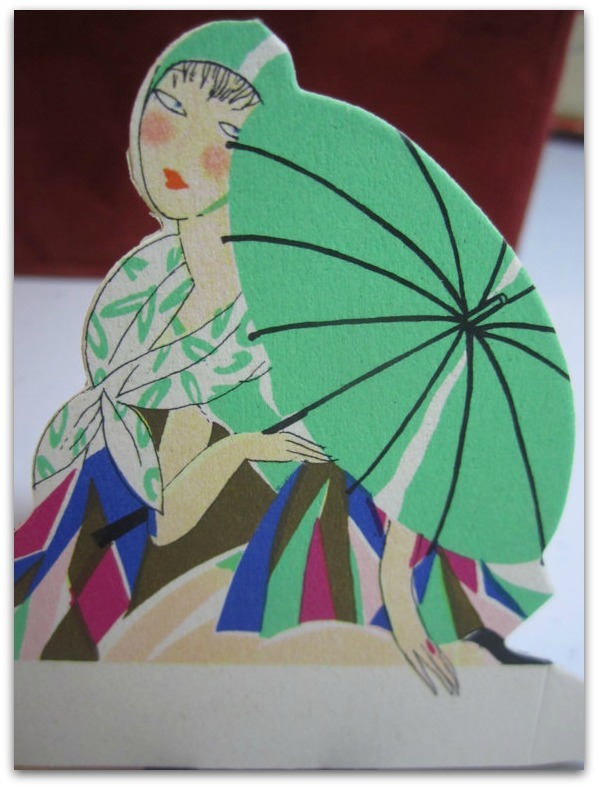 Puffadonna has the most incredible range of bridge score tally cards and other art deco memorabilia. I love to throw dinner parties and spend an age decorating the table so was very taken with her place-card settings as well – these were some of my favourites. 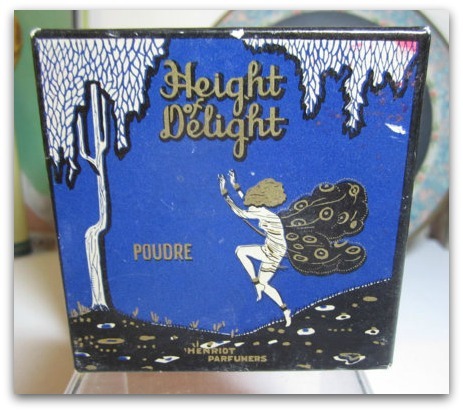 I also loved Puffadonna’s Art Deco face poudre box – Height of Delight, manufactured by Henriot Parfumers. Very typical design of the era and amazingly the box still has powder inside. Margaret from Curious goods trader must have been jumping for joy when she found this large advertising sign as these original signs are very hard to come by. You have to be careful you are not buying a repro which has been made to look old which I’ve seen a lot of at fairs. 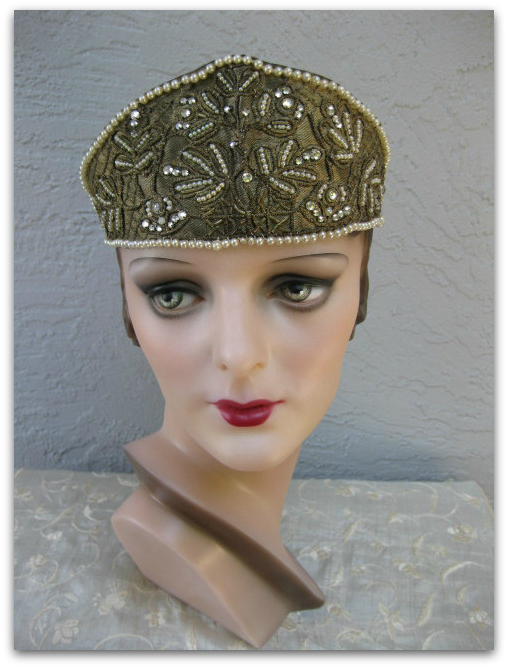 This beauty was originally mounted to a building and the flapper lady with her bobbed hairstyle is very typical of the era. Beauty and the preparation for partying, was taken very seriously in those days – the dressing tables with all their beauty accoutrements were a sight to behold, filled with perfume bottles, vanity sets and jewellery. 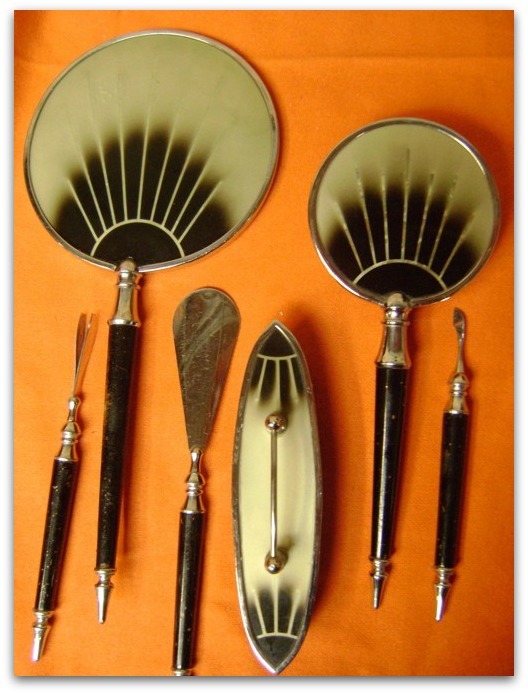 I’ve picked out some stunning dressing table items – just look at this superb example of a vanity set from Etsy shop Abelincolnsdog consisting of the mirror, brush, tweezer, nail buffer, nail scraper and shoe horn. I really want this. 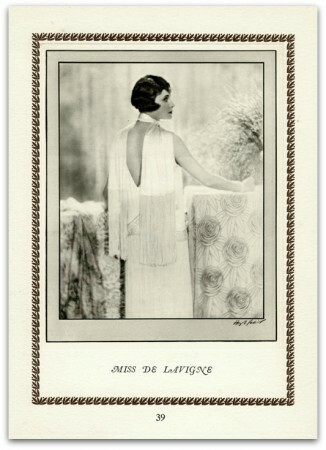 Here’s a charming portrait of society lady – Miss de Lavigne taken from a dis-bound copy of the ‘Book of Beauty‘, published in 1926 and being sold by Marcade Vintage Prints. Margaret says that various ‘society’ ladies were photographed by Hugh Cecil using the technique of Photogravure (sometimes known as copperplate) which had a popular revival in the twenties. 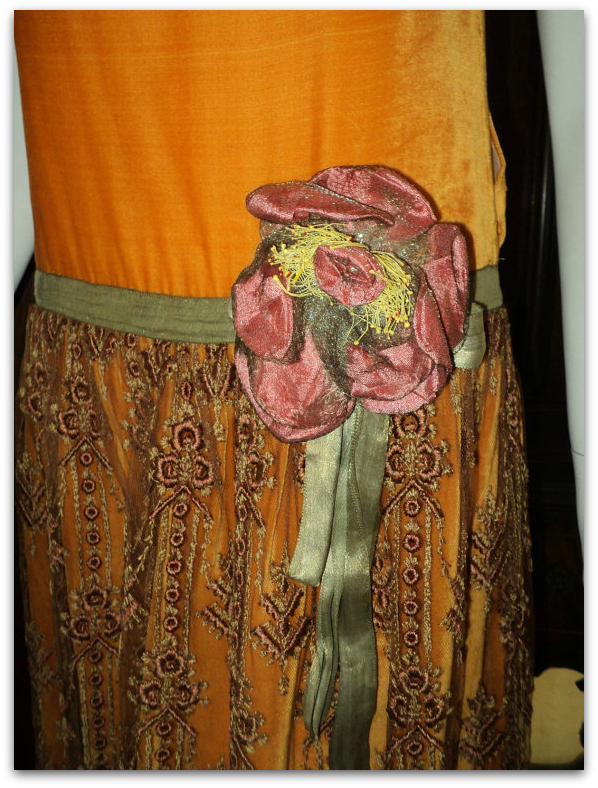 Can you imagine how free one would have felt when the fashions changed from the constricted corsets to these dropped waist dresses and shortened skirts – perfect for adding stunning jewellery and long strings of beads. The girls were dubbed the ‘flapper’ and hair was cut into a bob or Eton crop which was perfect to show off the popular drop earrings. 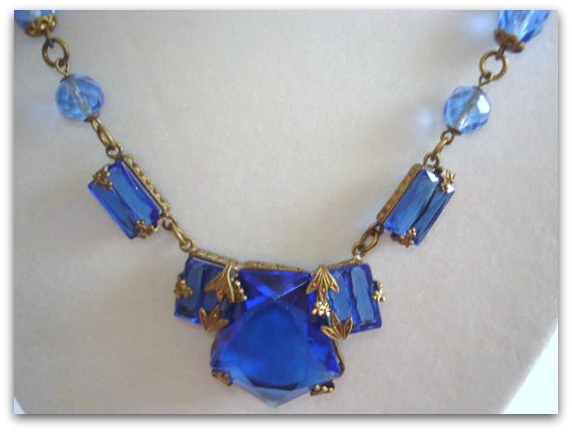 This Czechoslovakian signed antique sapphire faceted glass pendant bead necklace, from Sanibelsands Jewelry is such a gorgeous blue! Strong blues, reds, and greens were colours used a lot in the period – just take a look at this absolutely stunning green art deco tango purse made by the Elgin American company (EAM). 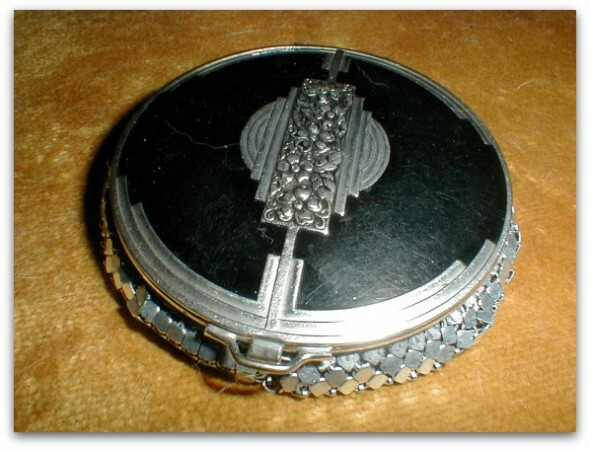 There is a circular panel on the lower lid which swivels covering a hidden compartment with loose powder! This is being sold by HUEisit who has some fabulous things in her shop. This next bag (made in Argentina) belongs to Danielle from The Uptown Purr. Danielle is on the board of directors for the Art Deco Society of NY and is a mine of information. She says that this bag is one of the most beautiful she has ever had. 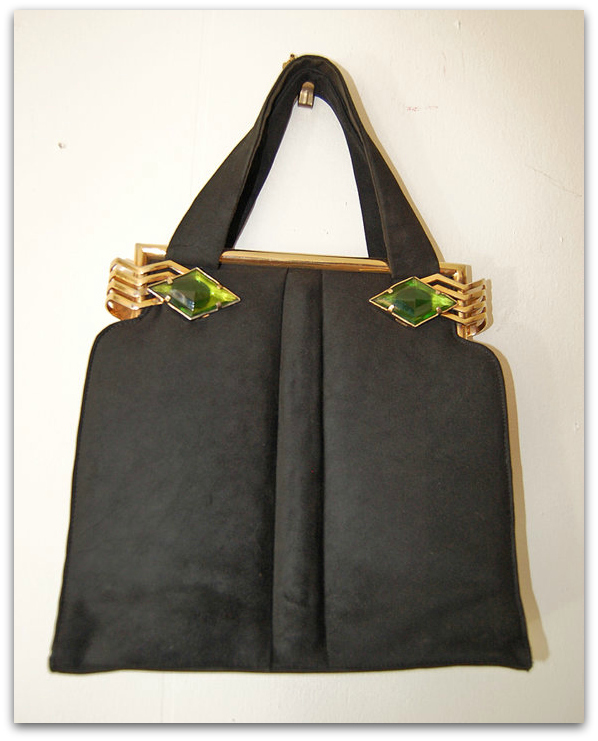 It is fine black suede with a goldtone frame and the best part for me is it ‘s adorned with diamond shaped glass emeralds which you release to open the bag. It also comes with an attached change purse. Simply divine. Danielle was kind enough to recommend this New York vintage fair and this vintage fashion expo in San Francisco and Santa Monica. Of course the look wouldn’t be complete without an art deco flapper headband and this one from The Butlers Cottage is an original from the 1920-30′s. There are clear prong set rhinestones and hand blown glass ‘pearls’ set amidst a gold metallic background that is embellished with satin stitched leaves and gold bugle beads. Or this lovely beaded flapper wedding headpiece/cloche cap from Daisy and Stella made with five rows of net with the bottom trimmed with gorgeous scalloped cream floral net lace! I chose two dresses from Bellasoiree. This one is an absolute stunner - a 1920s art deco rare metallic lace and gold lame evening dress. The drop waistband is decorated with gold lame ribbonwork and the top of the straps have small bows at each shoulder. 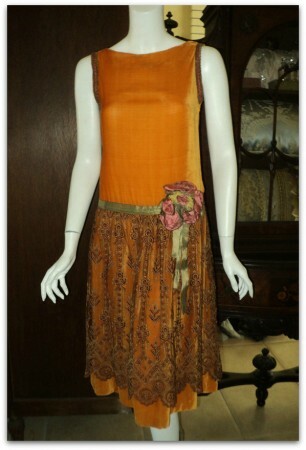 And this gorgeous saffron coloured silk velvet dress with embroidered tulle metallic lame sash and silk ribbonwork. Ginger says the nap on the velvet is so soft and shows no signs of wear – she thinks it hasn’t been worn or worn maybe once and then very carefully stored away. 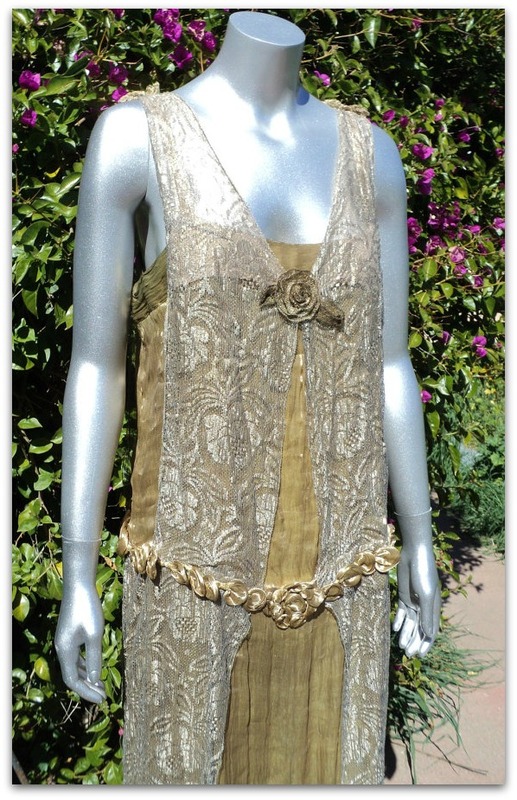 I wanted to show you this art deco sheer mesh with woven metal print dress with an Azute shawl from True Value Vintage because it is a great fashion history piece. When I go out buying textiles I always grab any pieces that I see like this (although I have only managed to purchase tiny pieces), A short sleeved dress with small slits on either side. The stylized print is running men and decorated women divided into architectural grids made of small metal plackets that have been woven into the mesh. 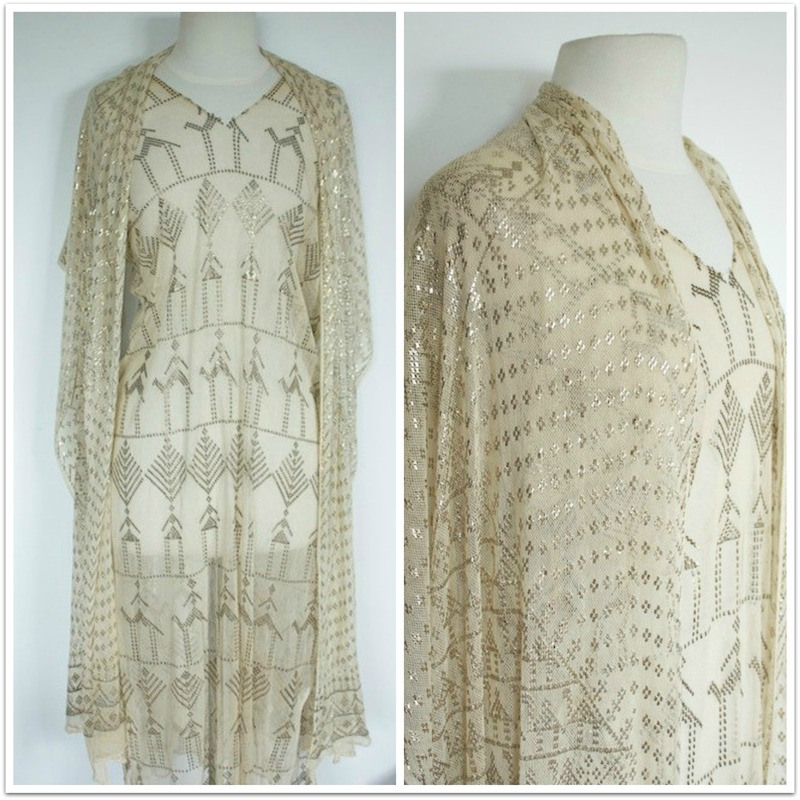 The azute shawl matches the print of the dress but has the addition of camels in triangular grids. What a lovely period in fashion and design. If you want to know more about the period ICADS is the International Coalition of Art Deco Societies and in the USA Art Deco Society of NY offer walks, tours, lectures and sales – I didn’t even know there were Art Deco real estate specialists – how fab. The London Art Deco Society offer events and English Heritage run an Art Deco fair at Eltham Palace. Wonderful post and amazing items! I adore the die cut place cards & bridge set – would love to have them for decoration! 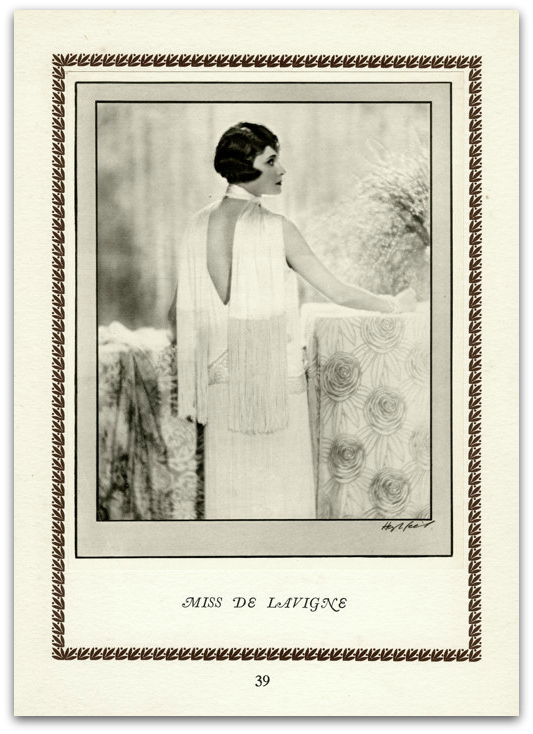 The deco purse is amazing and I have a special weak spot for all the amazing dresses of that period. 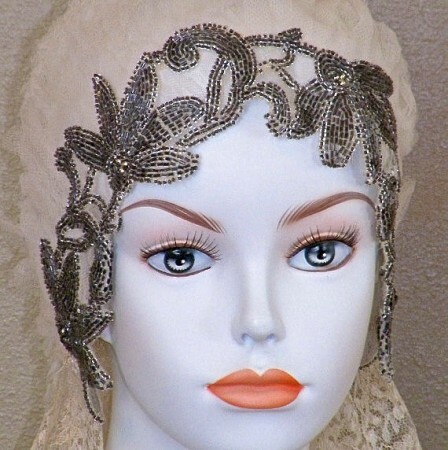 Thank you for including my beaded wedding cloche! Off to see the film tomorrow! Thanks for trawling the internet to get us such a delicious haul. Hope to find similar treasures to admire on screen. 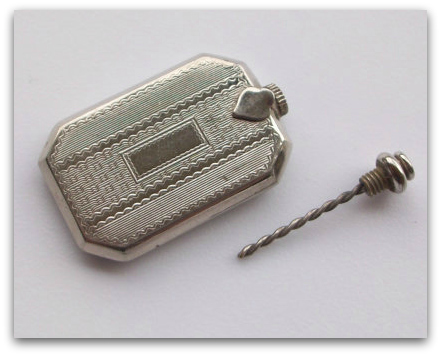 This is a terrific blog piece about vintage items!! I just saw the movie Gatsby (which I loved!!) and one can’t help but drool over all the gorgeous Deco style items – everything from car to clothing to decor. 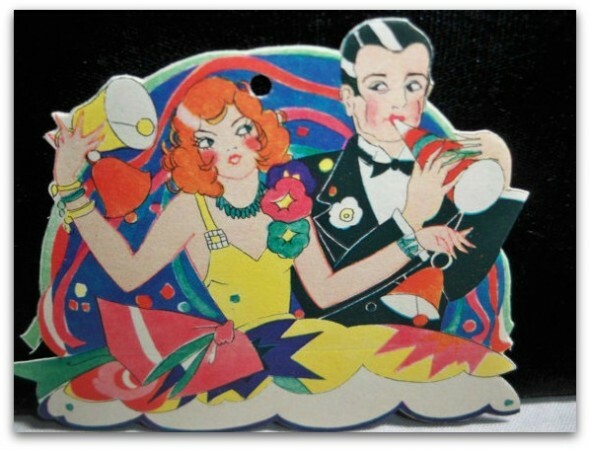 This “Waiting for Gatsby” posting does a great job at selecting a representative variety of Deco items. Thank you so much Elise for your lovely comments – glad to know you enjoyed the blog and the movie. Wasn’t it great. Loved the costumes and jewellery.